We are proud to announce that Kristina Mizikar is our 2012 Youth Recognition Award Winner. Since birth she has been a member of FCSLA Branch J-441. Kristina participates in many activities sponsored by her branch. She also participates in the Cleveland District’s Join Hands Day projects by planting flowers, weeding flower beds, cookie decorating, serving food, clean up duty and enjoys spending time with the residents by painting their nails. 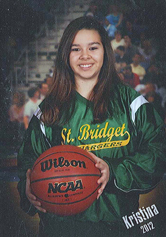 Kristina is a recent graduate of St. Bridget School in Cleveland, OH. In grade school she participated in a variety of activities. Kristina was a cheerleader, basketball player, choir member, band member and either played her clarinet or had a part in her school’s productions. During her lunch hour she volunteers helping with learning disabled students. She seems to have a talent and the patience needed to assist these students. Kristina also serves as an altar server and a school crossing guard. She takes Karate lessons and spends time with her handicapped cousin offering her companionship whenever she has some spare time. Kristina is also a trusted babysitter. Kristina is a very bright, cheerful and helpful young lady. Her father is in the United States Coast Guard and has been deployed several times. When her father is deployed she gives her Mom an extra hand with meal preps, dishes, laundry and watching her younger brother. She will be attending Holy Name High School in the fall. Kristina will be playing her clarinet in the High School Marching and Symphonic Bands. She would also like to play football (which the school allows). Her nomination was submitted by her proud grandmother, Florence Mizikar, who is Secretary of Junior Branch 441. FCSLA congratulates Kristina Mizikar for representing our younger generation of members. We are very proud to have Kristina as our member and as our “2012 Youth Recognition Award Winner”. May God watch over her in all her future endeavors.